Love the story, which only goes to confirm my view that the world is impossibly small. My own experience of small world syndrome is that the Husband and I were in Cairns at the same time and probably hanging out in the same places 11 years before we met. And of course, Coffs Harbour being the centre of the universe, I lived and worked there before I met him, and might even have bumped into you both at some stage! It fascinates me, and I think it cannot be entirely random, and there is some Universal pre-planning behind small world syndrome and the synchronicity we experience. You only have to read Celi’s account of how she and Our John met, missed, met again and married. One of the most fascinating ‘how we met’ stories, and clear evidence that some things are just meant by the universe to happen. It sounds like the start of a collection of stories to me, Ms Ella Dee…. something along the lines of Celi’s Letters to My Little Sister. Perhaps a future project, hmmm? Why not, she says, I love a good anthology… Let me write a story and do some research. I’ll share and see if there’s any interest. -grin- Maybe there’s hope for me yet then. Happy sort-of-25th! I loaned a work friend a pile of LP’S ( ANYONE UNDER 30 JUST ASK) but when the job we worked on finished, didn’t get them back. When I met Julia we used to listen to music and going through her records one night noticed a lot of similarities and then on one some initials. Turns our her ex boyfriend had left them there. Guess who. I had to marry her to get them back.She took me to meet her parents and ask for her hand (and the rest of her) and I not only knew the place but I’d decorated it when my paternal grandmother had lived there. I got Julia’s hand and also the job of redecorating the place again. You and the G.O. had a slightly longer engagement but have proved to be just as Happy. Roll on Taylor’s Arms. One of the wonderful things about blogging, sharing with others who truly appreciate and understand, amazing, heartwarming stories. Very kind, but I use the competition as motivation to write a short story. No-one would be more surprised, or happier, than me. I would buy up all the copies and mail them out! I love your story, EllaDee. I had the opposite experience. I don’t think the Fella and I would ever have crossed paths in our earlier lives. It took the MUA dispute in 1998 for those paths to intersect. Now of course we amble along the same path, and only sometimes at different speeds! Thank you 🙂 Who knew? Certainly not me! That looks like a long road to happiness, congratulation. I enjoyed reading your story and I think you have a good chance of winning. It was a long road but headed in the right direction 🙂 A number of story ideas came out of workshopping the theme ‘branching out’ out via a blog post. This one didn’t make the cut but I’ve managed another of 2000-ish words that may be a last minute entry. Thank you. Only 25 years long! 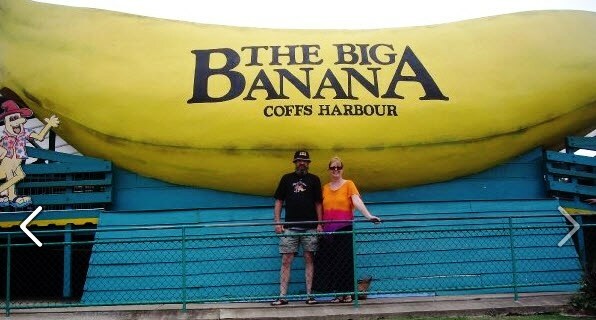 The Big Banana (according to Wiki) has been around longer than me, built in 1964 one of Australia’s first Big Things. I think I may have visited age 6 enroute to Queensland. The G.O. remembers when it was new, and his family bought a tractor from the owners which is still parked in the shed at the old farm. Wow. How many almosts before it all came together so nicely! 🙂 Great story. You made me smile. Thank you 🙂 It’s always good when it -finally- comes together nicely. And so many times real life makes a just as good of a story as one we could make up. Such a lovely story. Life’s dance is so strange – the Universe does seem to be sorting, grouping, and placing players – trying things out here and there, until we finally recognize what’s right in front of us. Mysterious and wonderful at the same time.